Buy Silver > Why You Should Invest Today! Making the decision to buy silver can help you reach your investment goals without the risks associated with other markets. ➜ I’m ready to buy silver…where do I start? As the U.S. economy slowly recovers from the recession, there is still a lot of uncertainty that surrounds the stability of stocks, real estate, and the value of the U.S. dollar. Not surprisingly, more and more investors are choosing to buy silver and other precious metals to protect their hard-earned money from further volatility. Were you hit hard by the effects of the economic downturn? Did your investment accounts or retirement funds lose thousands of dollars in value in just a few short months? Were you forced to delay retirement or make other difficult financial decisions that adversely affected your lifestyle? Are you worried that the ongoing instability of the global economy will cause your worth to plummet again? You’re not alone. Millions of Americans are facing these same challenges, which is why silver, gold and other precious metals have become an increasingly popular option for people of all ages and investing experience. Whether you are planning your retirement for decades from now, or it’s just a few years away, now could be the perfect time to buy silver. Although silver and gold each has its own unique advantages, many people invest in them for the same core reasons. Let’s take a look at some of the key benefits of buying silver, as well other precious metals, such as platinum or palladium. ➔ Those who buy silver are making a smart investment for their future. The value of silver has continued its steady climb over the years, and many experts believe that we are nowhere near the peak. ➔ In early 2013, the price of silver was around $31 per oz. Figures released by JP Morgan suggest that silver could reach $380 or higher before experiencing a significant decline. ➔ Over the last decade, those who invested in silver have already experienced these gains. An example we often give is that a silver investment of $100,000 in 2002 would yield over $600,000 just 10 years later. ➔ But if you had invested the same amount in an S&P index fund, you would have less than $120,000. ➔ Precious metals have always been an excellent strategy for hedging against inflation. ➔ The reason is this: when the value of the dollar drops (as it has tremendously over the last decade), the value of silver and gold tends to increase. ➔ Historically, when the economy hits a bumpy road, the federal government prints more money. This devalues the dollar and can hurt other markets as well. ➔ As a finite resource, silver can’t simply be printed. There is a limited supply, and yet there is more demand than ever. This is what raises the value of silver and helps protect investors’ purchasing power as the dollar declines. ➔ Investing solely in stocks, bonds and similar assets puts you at risk of further devaluation when those markets plummet. ➔ Worse yet, those markets are known to fluctuate wildly due to a number of external factors that often have nothing to do with economic news at all. ➔ When you buy silver, you are effectively diversifying your portfolio and protecting your savings from those volatile markets. ➔ This is an important strategy for those who are planning for retirement, as it ensures your life’s savings won’t be eaten away by economic uncertainty. Talk To Specialist — Call (800)355-2116 Today! ➔ As an investor, you want to live tomorrow as you do today – but how can you preserve wealth when so much uncertainty remains in the global economy? ➔ When you buy silver or gold, you remove the anxiety associated with riskier strategies and you have the peace of mind that you’re taking the right steps for your future and your family’s future. The first step to making an investment of any kind is to educate yourself on your options and determine what’s best for your goals. 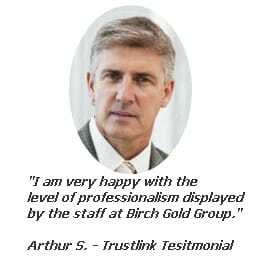 Birch Gold Group can help. 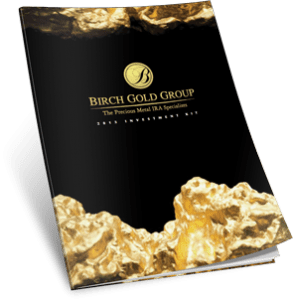 Birch Gold Group is a leading precious metals company committed to helping its clients find the right precious metal investments for their financial objectives. Known for our exceptional customer service, integrity and our completely pressure-free approach, we offer a variety of options including precious metals IRAs, silver & gold bullion, numismatic coins and more. Birch Gold Group also maintains an A+ rating with the Better Business Bureau. Whether you plan to buy silver, gold, or a mix of precious metals, we will guide you through every step of the process and answer all your questions, so you can be confident in your decision. Since no two investment strategies are exactly the same, we invite you to speak to one of our precious metals specialists who will be happy to walk you through all the available options. Call us today at (800)355-2116 or fill out the form on this page to learn more about silver investments.